Born in Camaguey, Cuba in 1955, DEMI is one of the most critically acclaimed Cuban-American artists working in the United States. She depicts a vibrant and intimate universe centered upon children, but hers is neither a sugar-coated nor an innocent vision. DEMI paints luminous and powerful children whose lives have been exposed to the vagaries of the adult world. DEMI has first-hand knowledge of the plight of children whose fates are altered by devastating events. Her father was executed in Castro’s Cuba when DEMI was still a child. Her family’s home and resources were all confiscated and they scraped together a living until DEMI was sent to Puerto Rico to live with relatives at the age of six. She finally joined her family in America in 1971, and they eventually settled in Miami where she studied at Miami-Dade Community College. DEMI is a sobriquet to indicate her life was cut in half by exile, and she emphasizes individuality and ambiguity by avoiding the use of a last name. DEMI deliberately employs a naïve style and paints mainly children. Her subjects are denuded and androgynous, preternaturally mature and far from ingenuous, reflecting their precocious experiences. Although rooted in her personal history, these subjects are fanciful and universal, with powerful social and political overtones. According to art historian, Lynette Bosch, “DEMI has created almost a new medium in her manipulation of acrylic paint because she is able to apply the acrylics in the translucent layering that is the property of oils. In stretching her medium in defiance of the limitations of accepted practice and expectation, DEMI has broken through pictorial boundaries that would bind any other artist. These paintings are exceptional in imagery, content and theme, but it is their technique that makes them significant artistic statements for those who value the manner in which an artist can reform our sense of materials.” For DEMI, the meticulous layers of paint represent layers of memory and meaning. DEMI’s work is highly acclaimed and has been widely exhibited and published. She has been represented in group and solo exhibitions for more than 25 years, and often uses her work as a forum to raise awareness for children’s rights. Since 1998, the Smithsonian's Archives of American Art has been collecting DEMI's primary records (correspondence, notebooks, drawings, photographs, catalogues). In 2009, DEMI was personally invited by the U.S. Ambassador to the Holy See, Miguel Diaz, to display one of her works in the U.S. Embassy residence in the Vatican City. The painting, Two Artists and Their Children of Their Imagination, will be on view for two and a half years as part of the prestigious ART IN EMBASSIES program. 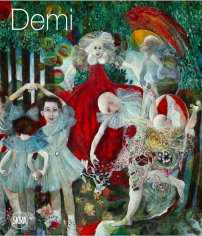 DEMI’s works are featured in many public and private collections worldwide and have been widely exhibited in galleries and museums in Switzerland, France, Panama, Puerto Rico and the United States.